The Global Volcanism Program has no activity reports for Kuntomintar. The Global Volcanism Program has no Weekly Reports available for Kuntomintar. The Global Volcanism Program has no Bulletin Reports available for Kuntomintar. 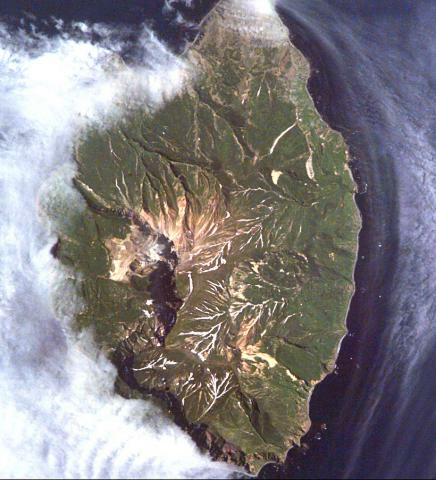 Kuntomintar is a Pleistocene andesitic stratovolcano that occupies the southern end of Shiashkotan Island in the central Kuriles. A central cone fills a 4-4.5 km caldera, whose rim is visible on the NE side. A second caldera on the west side is breached to the west. An Ainu village that reportedly was destroyed by an eruption in 1872 was later found to be located near Sinarka volcano (Gorshkov, 1970). The only known postglacial activity of Kuntomintar is continuous solfataric activity that originates near the east wall of the inner caldera and a nearby hot sulfur spring. The Global Volcanism Program is not aware of any Holocene eruptions from Kuntomintar. If this volcano has had large eruptions (VEI >= 4) prior to 10,000 years ago, information might be found on the Kuntomintar page in the LaMEVE (Large Magnitude Explosive Volcanic Eruptions) database, a part of the Volcano Global Risk Identification and Analysis Project (VOGRIPA). There is no Deformation History data available for Kuntomintar. There is no Emissions History data available for Kuntomintar. The Global Volcanism Program has no photographs available for Kuntomintar. There are no samples for Kuntomintar in the Smithsonian's NMNH Department of Mineral Sciences Rock and Ore collection. Large Eruptions of Kuntomintar Information about large Quaternary eruptions (VEI >= 4) is cataloged in the Large Magnitude Explosive Volcanic Eruptions (LaMEVE) database of the Volcano Global Risk Identification and Analysis Project (VOGRIPA).